We excel at helping our members succeed! Meet, Engage, Learn! Become part of the conversation! Members Listserv: Join over 900 members in lively, virtual conversation on topics such as practice and insurance matters, new legislation, articles of interest, referral requests, and more! Committees, Special Interest Groups, and Resource Groups: As the backbone of the association, committees, special interest groups, and resource groups provide expertise to the executive board and membership as a whole. Your expertise will be relied upon when reviewing legislation, and as resources for reporters and speaking engagements throughout New Jersey. They also provide you with a wonderful opportunity to increase your knowledge, inform others, and become acquainted with new colleagues. Affiliate Organizations: These geographically centered organizations offer psychologists and graduate students the opportunity to meet and network with colleagues in their area, to share information, and to attend exciting programming. We currently have affiliates in the following areas: Northeast (Bergen, Passaic, and Hudson), Essex/Union, Mercer, Middlesex, Monmouth/Ocean, Morris, Somerset/Hunterdon, and South Jersey. Enjoy discounted rates on all NJPA online and in-person programs! Students, early career psychologists, sustaining members, mid-level members are guaranteed special discounted rates. We can help you earn the credits you need toward your mandatory continuing education requirements! Helping members grow and maintain healthy practices is a high priority for us at NJPA. Our referral network makes it easy for you to build your practice! As the most visited page on our website (receiving over 1,500 visits per month), NJ residents are seeking mental health professionals in their area to suits their specific needs. In order to get started, consider the information you feel would be most advantageous to include in your online profile. You can include a photo, description of your practice, areas of expertise, foreign language proficiency, multi-cultural competence, insurance panels, a website address….anything you feel would assist a consumer in their decision-making process for finding an appropriate mental health provider. You tailor your profile to reflect your unique expertise and experience! NJPA is here for our members to help you through any professional difficulties you may experience. Our Director of Professional Affairs is available to assist you with practice questions, ethical concerns, licensing laws and regulations, and help you understand the impact of new and pending legislation. The NJPA Ethics Education and Resource Committee offers free, confidential feedback, exclusively to NJPA members, concerning ethical questions that may arise in the course of their practice. The information provided by the Ethics Committee is designed to assist NJPA members to better understand ethical issues arising out of the practice of psychology in an educative and consultative manner, however is not in place of legal advice. NJPA is committed to strengthening our political outreach and advocating for the interests of NJ psychologists and mental health issues that are important to the public. Over the years, our advocacy took many forms. Through our Committee on Legislative Affairs (COLA) and our Governmental Affairs Agent (GAA), NJPA has been instrumental in maintaining standards of psychology practice in NJ, protecting patients rights, and supporting public policy. 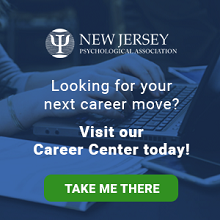 NJPA also monitors State Rules and Laws that regulate the profession, and maintains a liaison with the NJ Board of Psychological Examiners so we are always informed about any changes that may affect our members. As an affiliate of APA, NJPA is also involved in federal advocacy initiatives and regularly lobbies for federal issues that affect psychology. We make it simple to find everything you need! Our members only portal is packed with information on laws and regulations affecting your practice, best standards in maintaining your practice, form templates, Peer Review, Child Abuse Reporting requirements, weekly updates by our Director of Professional Affairs, and more! Diversity and inclusion is a priority for NJPA. Our Committee on Diversity and Inclusion (CODI), together with other NJPA committees and the NJPA Foundation, support diversity and inclusion in all association activities and assists the board in fulfilling NJPA’s mission statement and strategic plan. CODI also assists the board by examining how issues of diversity and cultural competence in the field can have an impact upon the practice of psychology, education, training, research, and public policy. Along with our referral network, NJPA maintains a listing of all members that can be accessed for finding colleagues in your geographical location, and throughout the state, as well as fellow alums who attended your university/college. Our weekly e-blast, the Friday Update, keeps you up-to-date on association news, CE programs, committee and affiliate events, APA updates, and more! Our professional journal, the NJ Psychologist, is printed three times per year. You will find association business, a special section featuring a specific topic, the NJP Foundation activities, ethical situations, and other informative articles, some of which are available for CE credit. We distribute an Annual Report in the 3rd quarter that details the association's accomplishments over the year, outlines the finances of the organization, and acknowledges the work of our members and volunteers. Our quarterly e-newsletter is geared toward the public and includes articles centered around a unified theme. We encourage our members to share our e-newsletter with colleagues, family, friends, and clients!